The Absolute Truth is that there is nothing absolute in the world, that everything is relative, conditioned and impermanent, and that there is no unchanging, everlasting, absolute substance like Self, Soul, or Ātman within or without. 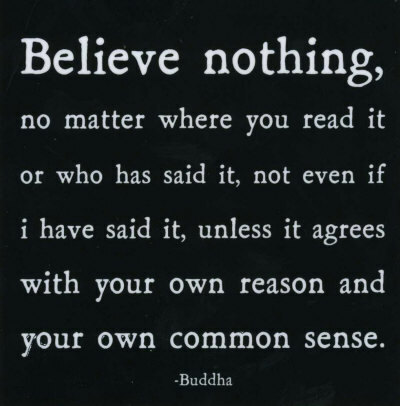 – Buddha. Absolutism: any theory holding that values, principles, etc., are absolute and not relative, dependent, or changeable. Philosophy: the rational investigation of the truths and principles of being, knowledge, or conduct. Absolutes are unattainable. This means that nothing can be defined with absolute certainty. Any certainty that one holds is subject to re-examination in the face of inconsistency. Philosophy is an investigation of what is really there. It makes progress by thoroughly examining inconsistencies to the point of eliminating them. Nothing that exists is so sacrosanct that it is beyond re-examination. This stance may seem to be inconsistent with the principle of Confusion and Stable data promoted by L. Ron Hubbard, but it is not really so. According to Hubbard’s principle, mental confusions are held at bay by beliefs, and if those beliefs are destabilized then a person may be overwhelmed with confusion. This is apparently true. However, it is always possible to replace a belief with a more consistent belief. But this may be regarded as addressing a conditioning with another conditioning. This seems to take place in the subject of Scientology. An optimum course would be to remove the confusion altogether so a belief is no longer required. This seems to be the approach in Buddhism. Absolutes and personal certainty don’t seem to be an issue that I’ve observed. These don’t seem to be a problem to come up with. Possibly the search for an objective reality is the problem? There is certainty of beliefs and fixed ideas. They are treated as absolutes. I am sure you have come across them. Have you ever come across somebody with certainty about God? Or, certainty about self? Is the Grand Design simply the most Grand Illusion? Objective reality is, of course, relative in this universe. There is another objective reality underlying what we see, and another one underlying that, and so on. Thinking that there is an absolute objective reality would be another absolutism. There is no absolute objective reality. This is how it is. Therefore, I would not call it a grand illusion. I would simply call it… IS-NESS. So subjective reality is maybe the top layer of objective reality? And considerations fall into place where? I would not say that subjective reality is the top layer of objective reality. Subjective reality is more like what one feels and/or visualizes about things. It is how one has connected the dots to get an understanding. But it may also consist of premonitions, etc. Subjective reality can go very deep. Object = what is out there. From this seems to come the idea of OBJECTIVE. Subject = what one thinks of what is out there. From this seems to come the idea of SUBJECTIVE. Pure objectivity is called NIRVANA in Buddhism. Here one is looking at even SELF objectively. Now you are splitting them back up again and off we go again. I do not think there is a very good way to split these up, in other words, I do not think there is a sharp line to draw. There is no splitting up anywhere. It is simply looking at whatever is there from different angles. Considerations are everywhere. Considerations underlie both in the perception of “objective” and in the connecting of dots, which is the subjective part. A Scientologist would say, “Oh! These are the definitions of the words, and we must never question them.” Why are these definitions so sacrosanct? Because if we question them it will shake their stable data of Scientology? Didn’t Hubbard change many of those definitions? Didn’t he introduce many new words and definitions? Didn’t he then want those definitions to be the status quo? Why should there be no further investigation of the definitions underlying these words? A closed mind wants to keep the status quo that it has settled on. That mind is not an explorer no matter how much it pretends to be one. It doesn’t want to look at its own assumptions. Rafael, I just found it by googling, because I knew it was there. My wife had it on the refrigerator for quite some time. greetings to your beautiful wife, you are a lucky man. She calls me some other things too. But she is fiercely protective. I am guessing “sweetheart” or other term of endearment? Yes! The space that she gives you is for you to do with as she pleases!!! hahaha – just joking of course… We are lucky indeed to have mates who support and nurture us even though we are very crazy. Taking on ex-SO for a mate cannot be very easy for them! I think re-assimilation of ex-military dog would be easier task, easier to civilize. The difference between Religion and Philosophy is that Religion tends to be absolutist. I dunno if this is THE difference. There are a lot more differences than this. What would be similar between religion and philosophy? These two aren’t the same and neither are they two sides of a coin. They are related but no more than sister fields of study, are they? I see religions putting limits on looking. They ultimately lead to a closed mind. I see philosophy entertaining no such limits. Right, the philosophy of not entertaining limits does not entertain limits but the philosophy of entertaining limits does. These sparkling generalities are creating categories which are not working for me. All that I mean is there are no absolute limits as far as I know. Whereas, religions create limits through undefined absolute sounding terms, such as, God. “Object = what is out there. This is not consistent. When you say it is relative, then you have made it subjective. If you disagree then please explain what you mean by “relative”. Chris: Now that is an eloquent way of saying that. Nice and short and perfect. I think we have been shown a blind alley with subjective v. objective… Useful at the macro, but at the root, not so much. Without experiencing a loss of havingness (hehe) I am thinking that at the root, things are very different from both what we have been taught and how things seem. @freebeing: The entire concept of subjective vs. objective doesn’t cover it and IS inconsistent. There is “absolutely” nothing absolute about objective reality and subjective reality is wide ranging and regarding orders of magnitude, may be a subjective flea on the back of an objective dog. Subjective impinges very slowly and tediously on objective if and when it does at all.